–“The Boy in the Striped Pajamas” – For once, my tolerance for syrupy faux-tender moments in Holocaust movies was not challenged. The film isn’t afraid to show Nazis as people making tough decisions—unlike the recent and highly-praised “The Counterfeiters” or the supposedly-classic “Schindler’s List”—and the movie always holds the characters above the plot. The humanity of the characters—every character—is essential to the movie. –“CJ7” – A poor man, his son, and an alien provide a wonderful coming-of-age story. Director Stephen Chow (“Kung-Fu Hustle”) equally employs his cartoonish antics and his moral sensibilities, complementing every hearty belly-laugh with a moment of tenderness. Highly recommended. –“Religulous” – Larry Charles’ (“Borat,” “Curb Your Enthusiasm”) film about Bill Maher’s search for truth in religion is less a fact-based documentary than an intense personal essay of a man who questions God—or any deity, for that matter—with the same passion as an inquisitive child. As usual, Maher is hilarious, and his sensibilities are actually more Christian than some of those who call themselves such. -“Slumdog Millionaire” – A boy of the streets comes of age by learning to see the past tragedies of his life in a new light. The film is told in a fairy-tale style perhaps, but it’s one that makes you smile with the joy of life. A rich, warm piece of work. –“Trouble the Water” – This Hurricane Katrina documentary takes a personal look at a family who braved the storm with their camcorder and recorded their experiences in the Ninth Ward of New Orleans and away from home. The film successfully captures the array of emotions that locals experienced during the storm. “Trouble the Water”’s power is unmatched in any other film I’ve seen about Katrina. 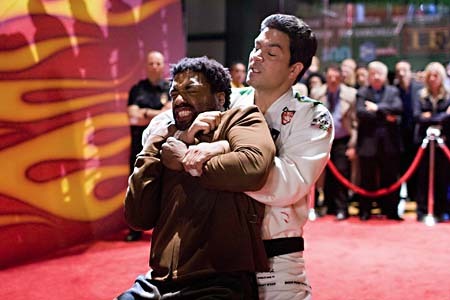 10) “Redbelt” – The newest film from playwright David Mamet (most famous for “Glengarry Glen Ross”) continues his love affair with con artists, this time in the arena of mixed martial arts. Themes of loyalty and honor code vs. morality keep the movie fresh and avoid it from being a retread of “House of Games” or any other Mamet movie. He’s still dark, and by the end, you’ll see he’s still a pessimist. 9) “Funny Games” – Michael Haneke’s shot-by-shot English remake of his Austrian original is best seen as a post-modern horror film, showing evil running amok in an upside-down, confusing world that follows no clear rules. It’s the kind of scariness that seeps into your bloodstream, and the movie is startlingly appropriate for–at least at the time of its release–Bush-era America. 8) “Standard Operating Procedure” – Errol Morris (“Fog of War”) this time approaches Abu Graib while simultaneously tackling technology’s toll on the truth. The film is haunting as a report of what happened at the infamous prison camp and existentially as an approach on both documentary films and technology. 6) “Happy-Go-Lucky” – Mike Leigh’s new film explores how uppety Poppy (Golden Globe-winner Sally Hawkins) lives in a world of happiness, and maybe naivete or ignorance. When she starts taking lessons with grouchy driving instructor Scott (Eddie Marsan, who deserved a Best Supporting Actor Oscar for his work), their personalities clash, and she gets a broader view of the pain and suffering that exist in the world. Grows on you–especially after a second viewing–and blooms throughout the running time. Wonderful stuff. 5) “4 Months, 3 Weeks and 2 Days” – This Romanian gem takes the audience for a trip down the rabbit hole, to the 1980s when abortion was still illegal in Romania. Through deliberate pacing and depending on showing more than telling, the film painstakingly shows the steps two desperate women must take in order to terminate an unwanted pregnancy. You won’t forget this movie. 3) “Rachel Getting Married” – Johnathan Demme’s freest movie since “Something Wild” and his best film since “Silence of the Lambs.” Alongside a career-defining performance from Anne Hathaway, this film about the high tensions between family members at a wedding celebrates all the joys, desires, and ugly aspects of life. I’m tempted to call it a modern classic. 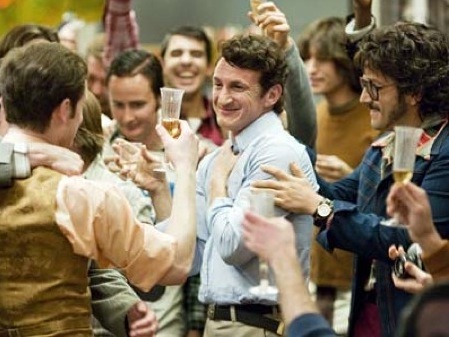 1) “Milk” – Sean Penn owns the character of gay-rights activist Harvey Milk in the best performance of the year. Despite a somewhat by-the-book plotline, every other shot is filled with subtleties that enrich the story of a simple man who achieved greatness. The film embodies Americana as well as “Mr. Smith Goes to Washington” or any Norman Rockwell painting and does so just as powerfully. The film will leave you on the verge of tears, and that’s as long as you don’t cry first. But to be sure, this list isn’t definitive and will probably change. [I’ll update it if need be.] There are plenty of critically-acclaimed movies I have not seen (“Flight of the Red Balloon,” “Paranoid Park,” “Let the Right One In”) and many I have but may need to watch again. But of what I’ve seen in 2008, I offer to you what I find to be the very best of last year’s films. Until next time, happy watching, and I’ll update as much as I can.